Seattle Opera will receive a $500,000 grant from The Andrew W. Mellon Foundation to support the production of Amelia, its newly commissioned opera. The four-year grant, a first-of-its-kind initiative, will provide crucial funding for contemporary opera, enabling Amelia to be produced by two other American opera companies following the opera’s world premiere in Seattle in May 2010. 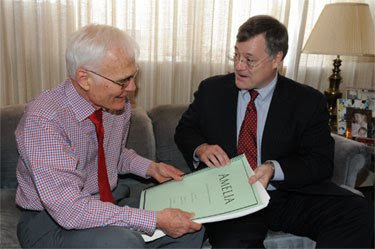 In addition to the Mellon grant, the company announced that the Charles Simonyi Fund for Arts and Sciences will be Amelia’s production sponsor, with a generous $300,000 gift in support of the production. The Mellon Foundation grant will underwrite the rental and royalty expenses for up to two additional opera companies to produce Amelia. A portion of the grant will also help Seattle Opera make costumes and sets that are easily alterable for other companies, cover any necessary score or libretto revisions, and fund the creation of new audience development methods. These announcements coincided with the arrival of Amelia’s orchestral score in Seattle, hand-delivered to Jenkins by composer Daron Aric Hagen on Friday. Amelia features an intensely personal libretto by poet Gardner McFall and a story by director Stephen Wadsworth. The creative team includes set designer Thomas Lynch, costume designer Ann Hould-Ward, lighting designer Duane Schuler, and conductor Gerard Schwarz. It's thrilling to know that Seattle Opera is commissioning an opera and receiving much deserved support. Bravi, Mr. Simonyi and Mellon Foundation!! A great investment!! Glad also to see Mr. Simonyi also has better (more generally socially-contributive) than financing his trips into outer space ways to allocate his wealth!